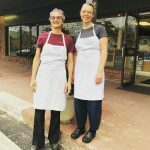 Raduno owners Janene Silverman, baker and chef, and Andrea Deibler, butcher and chef, have many years of combined culinary experience. Every day we cook with integrity and love to bring you a rotating menu of seasonal salads, sandwiches, baked goods, pastas and meats. At Raduno, we believe in supporting our local Michigan farming community and carefully source our meats and produce. We break down whole pasture-raised animals in house. We buy local organic flour for our fresh, house-made pasta and bread, and source the best produce we can from our community to create fresh and unique salads. We are so proud to be a part of such a vibrant and thoughtful food community here in Traverse City, Michigan.